By Emdad Rahman: A few days out of London are always a welcome change from the hustle and bustle of living in the frenetic pace of the world’s greatest city. And so we packed the car and set off to Brighton to live it up in a nice caravan site not far from the Marina in the South Downs and in close proximity to the attractive tourist destinations the town has to offer. 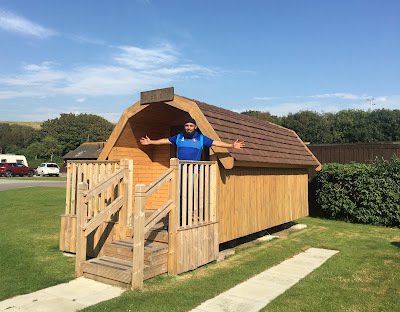 Apart from boasting a pleasant stay at the caravan site the Caravan club team have introduced wooden pods, which enable visitors to enjoy the great outdoors. We visited the Brighton location and spent an evening in the pods, an experience which was pretty unique. It was nice to get away from the helter skelter of city life and this is a fun and value for money stay for both camping enthusiasts and novices alike. We spent the whole day in Brighton with a totally packed schedule and the Brighton camping pods are situated perfectly to allow exploring this dazzling seaside city and the beautiful Sussex countryside. The pods are a great way for both members and non-members to experience the fun aspects of camping life irrespective of the season and the state of our great British weather. Each of the pods on location fit two people. The beds are basic yet comfortable and if you are tall in terms of height it is advisable to discuss this beforehand and decide space requirements prior to visiting. The pods are also eco-friendly and come fully equipped with power points, a table and an electric kettle. Clothes can be hung up inside too and snacks along with milk and tea/coffee can be purchased from the site reception. During our visit to Brighton we spent most of our time outside and came back to sleep in our pods. The atmosphere within the caravan park is serene and fellow campers are polite and friendly, There is a catering van serving freshly fried fish and chips all day long. Our wooden pods were a great opportunity to experience and savour the great outdoors without getting wet or cold. The pods are sturdily built, well insulated and clean. There is space available to park right next to the pod and the toilet block and wash facilities are a stones throw away. Small children can be accommodated in a pod but readers are well advised to make enquiries about requirements prior to booking up. If you don’t drive then there are regular buses to take you into town as well as the historic Volks Railway which runs along the prom. Brighton is a classic and lively British seafront town, filled with all the attractions you would expect from a famous coastal resort. The shopping is excellent with many unusual boutiques and antique shops to browse in. The town also has an operational pier, complete with amusement arcades and some of the finest fish and chips on the south coast, and is home to the Royal Pavillion. The site is also well placed for visiting the beautiful Arundel Castle and Gardens in nearby West Sussex, or the historic town of Lewes. With plenty to see and do locally and extensive recreational grounds adjacent to the caravan park, you're sure to have a holiday here that will be hard to forget. In summary, this is a warm, pleasant and cosy stay in the heart of nature. The Caravan Club have introduced pods in Brighton in East Sussex, Abbey Wood in London and Coniston Park Coppice in Cumbria. Each site offers pod camping all year round to members and non-members. Please note that camping pods are pet free. A minimum stay at weekends applies.